First, what is narrative tension? The word ‘tension’ itself comes from the latin meaning ‘to stretch’ (OED). When things stretch too far, they snap or break. It’s the same in a tense relationship, conflict, or story scenario. Tension is a state of uncertainty, and the anxiety it attracts. It’s like watching a tightrope walker wobble slowly on a thin line between mountain peaks. A scene involving a tightrope walker gives us the tension of the first definition, as well as the second. The rope is stretched tight. The walker has the psychological strain of focusing on the task. We have the emotional strain of hoping she doesn’t fall. In a relationship where two characters have conflicting demands or desires, we see mental or emotional strain when opposition devolves into conflict. Raising the stakes and complicating the situation for your protagonist is one of the most basic ways to create and maintain tension in a novel. In a thriller or crime novel, particularly, the situation typically grows increasingly dire for the protagonist. 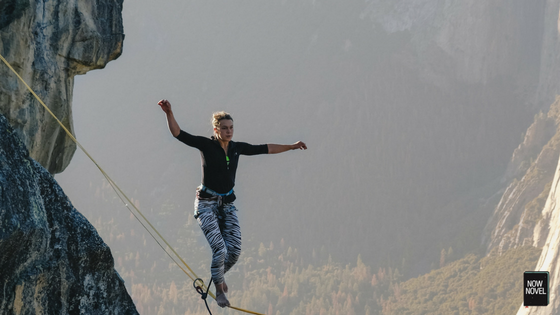 Escalating tension is one of the four most important factors of writing effective suspense, so your hero’s (or anti-hero’s) efforts to fix problems should sometimes fail. Suddenly he jumped up, seized the axe and ran out of the bedroom. The cliched metaphor ‘white as a sheet’ aside, this complication effectively adds tension. Raskolnikov has justified murdering the pawnbroker to himself, yet there is no way even he can justify killing her generous, ‘innocent’ (by his standards) sister. Dostoevsky introduces two kinds of tension: tension between Raskolnikov’s beliefs (his rationalization of his deeds falls apart as Lizaveta cannot fit it) and the tension of the emotional and mental strain resulting from his committing double murder. Dostoevsky piles on even further tension as we learn that handymen were renovating a nearby apartment and thus there were possible witnesses to Raskolnikov’s departure. These events add tension due to dramatic unknowns and the potential impact they might still have. We wonder how things will turn out and Dostoevsky uses this uncertainty to create tension and dread. When reviewing a first draft, it’s a good idea to take notes on where you have included scenes that introduce additional tension and complications. Make sure the larger-stake issues are not all introduced and solved well before the climax. In fact, a climax can introduce one or more additional complications that keep suspense taut to the end of your story. In addition to varying the degree of tension you introduce in conflict and suspenseful scenes, alternate tense scenes or sequences with calmer moments. Contrast is key to keeping your reader interested. A perpetual state of suspense is a difficult , stress-laden emotional state to maintain. In very short novels that have simple stories set within a short period of time, it might be possible to keep the tension high throughout, but more often, both your reader and protagonists may need time to catch their breath. For example, in Tolkien’s LOTR cycle, after the stressful, life-and-death conflict scene as his heroes pass through the Mines of Moria, we read of their stay in the Elves’ peaceful land of Lothlórien. This story segment gives us a break from the emotional intensity of the preceding action. When we think about creating tension in storytelling, we generally think in terms of protagonists and antagonists; heroes and villains. But remember to create moments of tension between characters who otherwise get along, as well as internal tension. For example, in a romance novel, in addition to the conflicts that keep the protagonist apart from their love interest, they might have additional conflicts with their sister or best friend. Perhaps your character is moody or glum about their lover’s distance or silence and snaps at others. Secondary, lesser or passing tensions help to keep subplots as interesting as main story and character arcs. Character-driven TV thrillers offer many examples of effective tension building. In Showtime’s political thriller series Homeland, the main character, Carrie, chooses to go abroad on dangerous CIA assignments. This is partially due to her committed, emotional investment in her work. Yet she also does so to avoid her fear of being an unfit parent to her child, as she struggles with her mental health. This creates a sense of there being unresolved internal conflicts in her life that leave viewers staying on for resolution. The story’s tension is strong, even when it’s a solo scene, for this reason. These are all excellent ways to heighten tension in a novel. Some incidents may be two or all three of these things at the same time. For example, the moment that Luke Skywalker learns the infamous, shocking truth about Darth Vader, the main villain in George Lucas’s Star Wars, is both a twist and a revelation. We don’t see this coming although it has been set up from the start in a number of ways. A famous reversal from classic cinema comes near the end of Casablanca when Ilsa learns Rick is not coming with her. A well-timed plot twist may plunge your characters into uncertainties that we as readers (or viewers) experience as tense suspense. One important point to keep in mind regarding tension is that it is not the size of the stakes but how invested the reader is in those stakes that matters. When deciding how to create tension in your plot, include emotion. Well-developed characters are critical for readers to become emotionally invested. Most passionate readers know the feeling of finishing a good book and feeling bereft without characters who came to feel like friends. Developing believable and engaging characters who are invested in their goals may seem unrelated to the task of building tension, but it is actually one of the most essential elements for creating this effect. 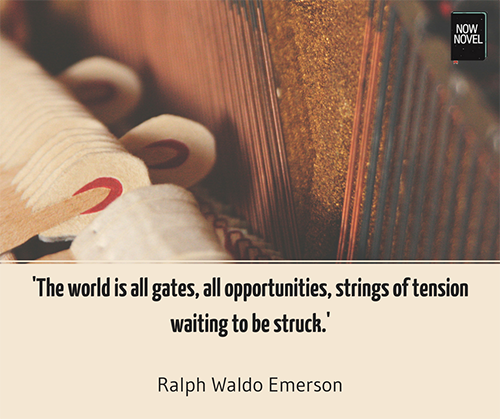 How else can you create tension in your writing? Active characters make things happen. They react, but they are also proactive. Passive characters let things happen to them. Passive characters are usually not the protagonist (except in tragedies), and they rarely create tension through outward action. 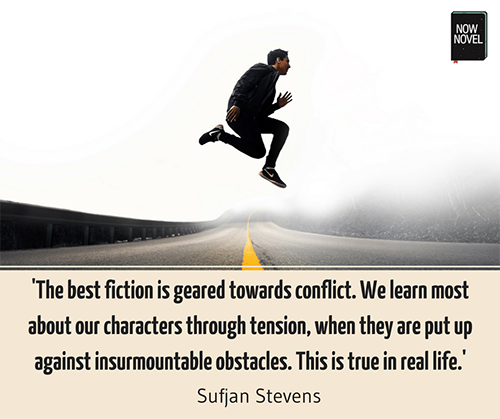 Internal conflicts are usually the primary source of tension where these fictional characters are concerned. Readers tend to like active characters better than passive characters. It’s hard to have much sympathy for characters who simply sit and wait for fate to overtake them. When active characters keep trying to solve their problems and keep taking missteps, story tension mounts. In a historical romance where two characters are separated by a work assignment, a war or another force, they might write letters, for example. They actively try to overcome the obstacle. Scenarios like these introduce more opportunities for mishaps and tension. You could, for example, have an entire chapter telling the story of a love letter’s progress as it’s misplaced, wrongfully delivered, returned to sender, and finally reaches its destination. Here, the tension is still between two characters but is shifted onto their communication itself and whether or not it reaches its target. All novels need tension, but different types of stories produce tension from different sources. The main tension in a romance novel will come from whether or not the protagonist and the love interest get together, or struggles they face with each other or facing external events. The main tension in a crime novel involves solving the mystery or catching a criminal. In a similar way to the tip about steadily raising the stakes, this may seem like an obvious observation. Yet often a novel that falls flat has forgotten to focus on what should be the main source of tension, the most urgent unknown. Once you’ve made certain that you have chosen an effective main source of tension, you can also look to other genre elements to create secondary tension. Your detective in a mystery novel might also be struggling with a romantic relationship. Characters fighting to save their home in a family saga might deal with a murder. Just be sure that you don’t let secondary sources of tension seem like they usurp and detract from the main conflicts of your story. Structuring your story well is vital if you want to create masterful tension. Try the structured Now Novel process to create a novel outline and stay focused on key, tension-building events.